With hard hitting lyrics, and a raw, rustic sound, Thakara is not your average rock band. Started as nothing but a fun project, the Ernakulam-based group has come a long way from their first song, Podi Penne a�� a piece about a nasty break-up. With six songs released on Music Mojo, a Coke Studio-like show on YouTube channel, Kappa TV, they are set to introduce fans to four new tracks. 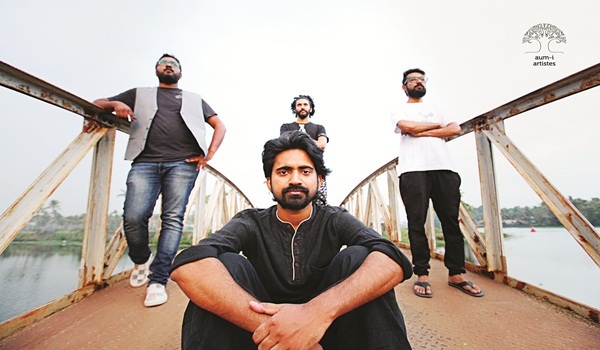 Thakara follows in the footsteps of Malayalam rock bands like Thaikkudam Bridge, and Avial, who have a huge fan base in the city. Initially featuring James Thakara as the lead vocalist with Swarathmaa��s drummer, Montry Manuel, David Crimson (lead guitar) and Liju Jacob (bass), the outfit now has an all-new line up. While Thakara continues to be at the helm, he is joined by Sreekanth Bhasi on electric guitar, John Joel on drums and acoustic guitar, and Ashwin Nath on synth and bass. Making their way to Bengaluru for a performance at Murphya��s Brew Pub, Thakara tells us about their journey so far. a�?We had performed live a couple of times with our old line up, but ita��s only after the new group was formedin January, that wea��ve been having regular gigs. Since January, we have performed seven gigs so far,a�? he shares. Describing their sound as ambient, electronic rock, he tells us about what they have in store for their Bengaluru performance. a�?Wea��ll be performing all of our 10 original numbers. The new tracks wea��re playing include Padilla, Ammachi, Anadha Parava and Kuru Mulagu,a�? he says. While Padilla is an experimental rock and electronica number that is a commentary on fascism, Ammachi deals with how society treats old age. Anadha Parava, a drum and bass track is something that they are excited about as ita��s a new sound. Kuru Mulagu (translating to black pepper) is really close to Thakaraa��s heart. a�?It celebrates the colour black. The media portrays dark skin as the opposite of beautiful. I wanted to speak out against such notions in the way that we do best,a�? he says.